Resource Conservation Districts (RCDs) play an important role in fire prevention and readiness, as well as post-fire restoration and recovery. In 2015 the Valley Fire burned over 76,000 acres in Lake County and was the third largest fire in California at the time. After the fire, Lake County RCD worked to distribute seedlings which were planted in 2017 and 2018 to help jumpstart reforestation and soil health efforts. The seedlings were especially needed due to poor seed set in past years and because the ferocious heat of the Valley Fire ensured the destruction of the soil’s existing seed bank. Year-old seedlings raised in nurseries have a much higher rate of success. 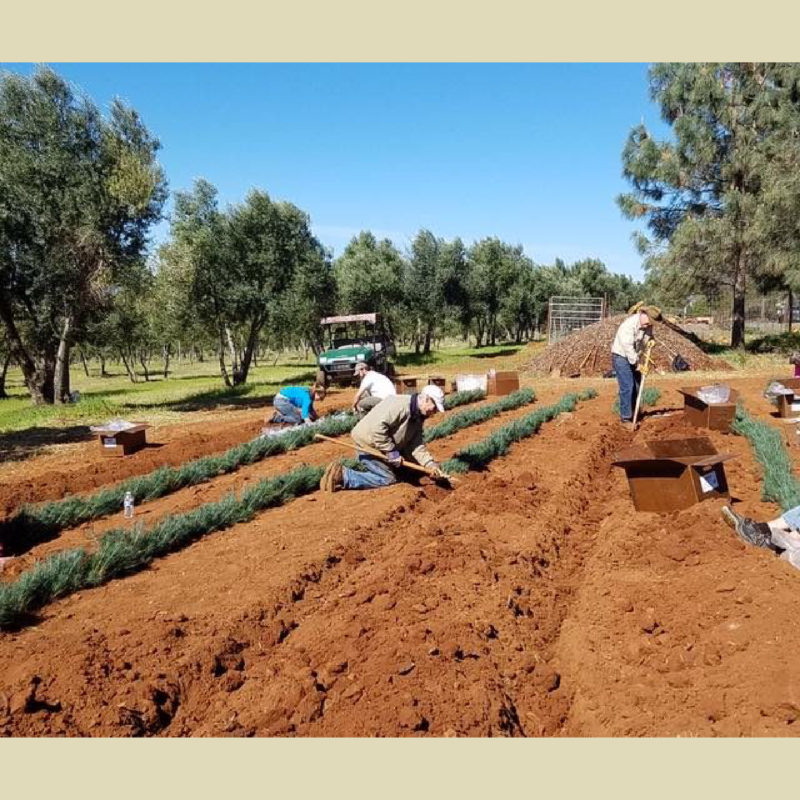 Successful cultivation of the seedlings — mostly ponderosa pine, but also douglas fir and sugar pine — was made possible through a collaboration between the El Dorado RCD and Georgetown Divide RCD’s native plant seed collection and propagation program. Funding was generously provided by the Lake County Winegrape Commission and four Rotary Clubs in Lake County which allowed LCRCD to sell each seedling at a deeply discounted rate. The RCD’s longstanding partnership with the National Resource Conservation Service (NRCS) also came into play. Though landowners had to pay for seedlings and their plantings themselves, NRCS’ Environmental Quality Incentives Program (EQIP) subsidized the replanting up to 80 percent. Due to limited demand and rising costs, the project will be coming to a close once the last of the seedlings are used. Though the project is winding down, there are still twenty thousand ponderosa pine seedlings and four thousand douglas fir seedlings left. LCRCD is taking orders for seedlings that will be available for planting as soon as conditions are favorable. They are also still taking orders for one-year seedlings that will be delivered in February of 2019. For any questions regarding orders, please contact LCRCD’s Victoria Brandon at vbrandon@lakelive.info.